Smashing the taboo; "it's when talking about mental health is as cool as going for a run"
How would you two describe yourselves in a Facebook description? After an international design competition first challenged Ramon to solve a problem he cared about around two years ago, Calmingstone was born. The product, a pebble-shaped hand-held device designed to help people manage their stress and anxiety, was a manifesto of Ramon's own mental health experiences and his passion for industrial design. The problem he cared about he knew straight away - it had always been mental health, and the solution came quickly too. After sketching down the first concept of the Calmingstone in his moleskin journal mid-movie night, Ramon set out on what became a two year journey to launch Calmingstone in mid-November 2016. By creating the Calmingstone, not only was Ramon going to help people feel better, but he was going to help bust the taboo that currently surrounds the mental health industry. The hope was that by finding a way to make looking after yourself cool (hopefully via the Calmingstone, but also via a wider cultural shift), it would become easier for people of all-sorts of backgrounds to take pride in how they could actively manage their state of mind and wellbeing. The goal is to build a world where it's as normal to go see a life coach as it is to go and see your PT. Alex joined the team when it became clear that the business needed her - she knew what Ramon was trying to achieve so clearly, and so she jumped in the deep end to help make it happen. They've been working with a group of collaborators to help pull off the launch ever since. Alex's main driver has been a desire to help make people feel like they're in control of their own headspace, and to make it feel like it's easy to change it if you want to. Alex: “I guess the best products come from people who are actually designing for themselves. We’ve listened to a whole lot of meditation apps for research, but maybe we would get bored by some parts of it, so we would shape our own audio to be more like something we would want to listen to. We made alternatives audios that don’t exist anywhere else, because we wanted them so badly for ourselves. There's a certain level of authenticity that comes with that. We're doing this because we need this Calmingstone too." There's two things both Alex and Ramon really care about; transforming how people manage stress, and evolving the conversation around mental health on from how it currently sounds now. 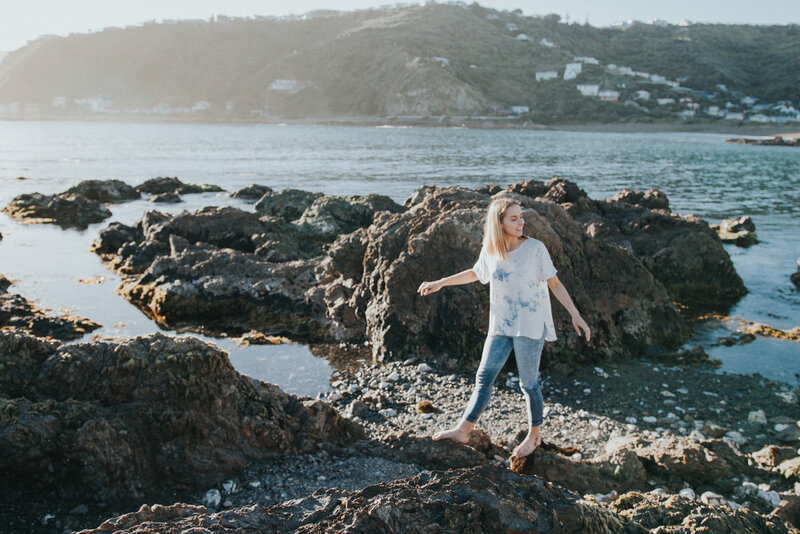 It's a challenge; the stigma that surrounds mental health issues in New Zealand is already enough to put many people off any product to do with mental wellbeing. The 'mental' stereotype runs deep, and is a tough one to break out of. Alex: "It’s quite difficult because people really struggle with how to talk about it, because there's such a stigma and all these trigger words that really get to people. It almost means we have to talk in a different language. We've got to have the conversation without really talking about mental health and wellbeing. People aren't ready to use those words yet. They're afraid of being put into a box"
When this topic can't be discussed freely and without embarrassment, it becomes increasingly difficult to solve. As it stands, the topic makes many people feel fairly vulnerable in opening up about it. In some senses, we've glorified those who can handle too much stress, or who can suffer the most. Then, if you talk to a specialist instead of your peers and it goes badly, you become even more unlikely to speak openly about what you're going through, and the problems keep spiralling. Ramon believes many of these mental states only develop because no one is there to talk about them, or about what you should be doing when you're feeling like 'your normal self' to keep from falling into a dark headspace. When it becomes okay - or even desirable to look after your whole self, then it is going to change how we talk about the whole mental health industry. But because we don't have a stigma-less language or culture around mental wellbeing just yet, it's a lot harder to know how to deal with it, or even how to start talking about changing it. Alex: "The words we have right now make it all seem so clinical and cold and stigmatised, and it feels like once you have this label, you can't get rid of it, so you ignore the problem. Even when you need to understand what you're facing, you still don't talk about it"
The long-term dream is to see culture shift, so that looking after your mental wellbeing become as cool and as normal as going for a run with your Nikes on. It was back in the 1950's that people who went outside to exercise were deemed crazy, and Ramon reckons that this shift is what's next for the mental wellbeing space too. There's a younger generation who will either be able to bust through the stereotypes, or who will resign themselves to a lifetime of stress and mental disorders. Right now, there's a real opportunity to educate and change the attitudes of the next generation of adults. Alex: "I like the idea that we’re all inherently meant to feel good. We’ve learnt to suffer. But you’re not born stressed." It's up to individuals to take control of their own headspace management. The key learning that's come out of the Calmingstone journey for A & R, is the realisation that you are in fact, entirely in control of what and how you think. Once you realise that you have a say in how you feel and react, a lot of what makes up stress and anxiety can be tackled head on. Ramon: "I’ve been in some horrible mental states, and I don’t want other people to feel like that. It's hard, but you just need to decide - hey actually, I've got this, this is what I can do now. Remove the emotion, and go through it logically. Soon you're removed from the situation and you can start seeing clearly." To get involved with the Calmingstone movement, you should know that Alex & Ramon have now launched their campaign on Kickstarter, with more than a hundred pre-sales having gone through for the stone in the first three days of launch. You can support the pair on Kickstarter, get behind their Facebook page, or start a conversation with them about feeling good and busting mental health taboos on Twitter. With your voice in the mix, this whole conversation can start to make some noise. 1. Find inspiration - "Solve a problem you care about. You need to care about it, because the journey to solving it is long and tough, and you need to be completely into it. Even then you still nearly give up all the time. But ask yourself - is this work meaningful enough for me? In our heads, we decided that we might as well try solve a social problem. It's our time now to be helping other people"
2. Start with passion and enthusiasm - "it's contagious, and you can really leverage that. Connect with people and express how much you care about this thing. It magnetises people to the cause." 3. Don't do everything on your own - "You do better when you don’t. When something is so close to you – you struggle to see all perspectives, and that's when you really do need knowledgeable people. If you spread yourself too thin, you just end up being mediocre." 4. Make a plan - have a detailed plan, and have a deadline. "You can rely on deadlines in uni, but the real world slides by. Have accountability in a team. Post a public deadline. It has to be something you can’t easily escape from"
5. Be consistent - "It actually doesn't matter how talented you are. Just keep going. Your work only gets better, and amazing ideas and companies never start that way. Movements and people who succeed are not always necessarily talented, they're consistent, and they're motivated to continually produce. So don't compare yourself with the top dogs. Start somewhere. Consistency trumps quality any day." 6. Smash the taboo, and make it cool to be across your headspace - "When you are in control of what you think and perceive, the world is your oyster. "